Chakkakuru Mezhukkupuratti is an easy to make tasty simple preparation. Tastes similar to potato fry. Goes well with rice paired with curries like sambar, rasam or curd. 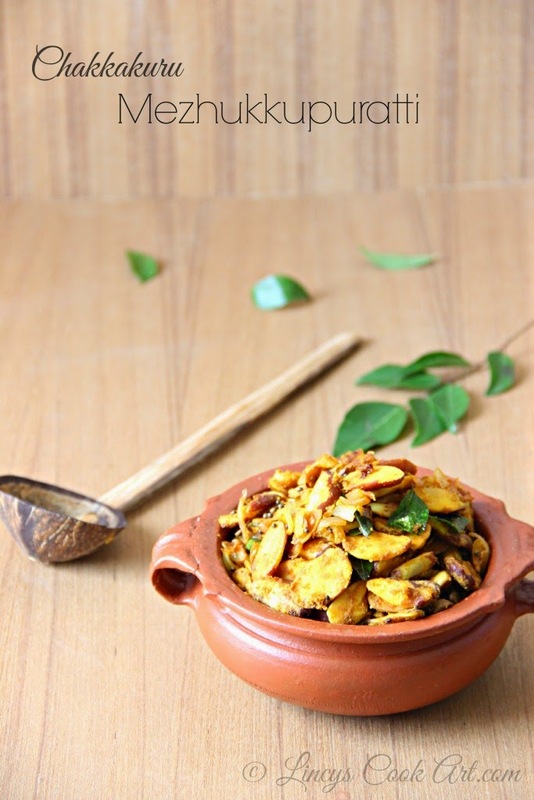 I have shared Chakkakuru Thoran recipe which is basically a coconut based stir fry. People those who wants spicy or those who doesnot like coconut in cooking can make this tasty stir fry. I bought some seeds from my native palce when i visit there and prepared this yummy dish now. I am sure those who doesnot like jack seeds also start love this preparation. Spicy preparation with no coconut in it. Peel the white skin from the Jack seeds and scrape the brown skin as much as possible with a knife and cut them in to two to four pieces. Pressure cook them with a cup of water and salt for one whistle. Cook easy to break stage but should not become mushy. Heat oil in a pan and add mustard seeds and small onion and allow to crackle the mustard seeds and allow to brown the small onion. Add the curry leaves and asafetida powder. Then add the chopped large onion and saute the onion for thirty seconds. Add the chopped garlic cook for further thirty seconds. Add turmeric powder, chilli powder and coriander powder and saute for five seconds and add the cooked jack fruit seeds. Mix well together and cook for further one minute. If the masala is too dry sprinkle a tablespoon if water and mix well. Note: You can add little garam masala powder if you wish at the end mix well before turn off the heat. You can cook the seeds in normal pan with salt instead of pressure cook them. oh....I am drooling here.....adipolly mezhukkupuratti...my all time favourite dish..
Looks interesting dish...... Love to try out!! yummy side dish n very neat presentation!!! Ooo chakkakuru mezhukkupuratti is my most favorite one.It is really well worth the effort to clean when the outcome is drool worthy. Lovvveee it yummm. Nice one! We too make somewhat similar to this but without onions and, we also do not peel the brown skin. Will try your version next time. Thanks. Tried this recipe today.. It was very nice. Thank you!